Your Pass Report is similar to a personal instructor, guiding you through the course by illustrating the areas that need additional study time, as well as tracking and reporting your progress as you move through the course. Your Pass Report allows you to see how much time you have spent in each lesson within the course, your final exam, exam simulator results and your overall preparation for the state exam. 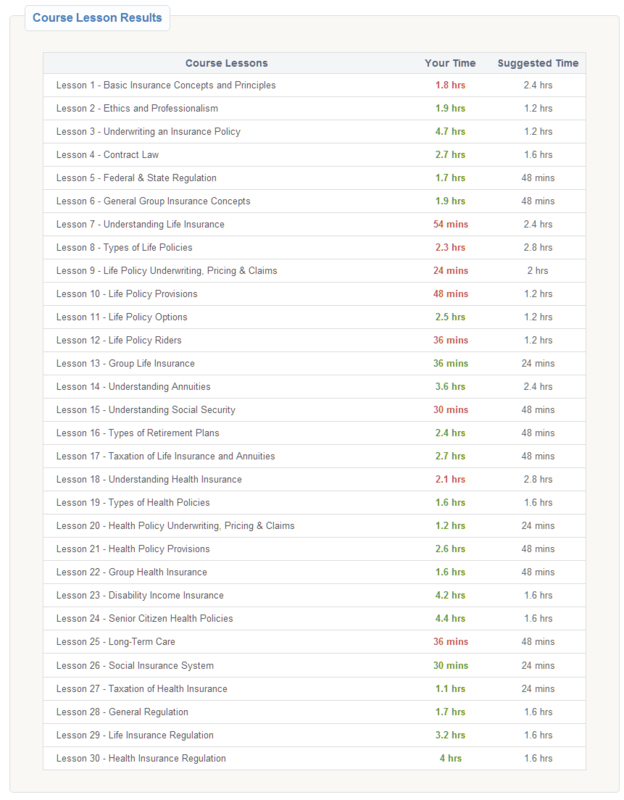 Course Lessons – We provide you with a ‘suggested time’ which represents the amount of time we estimate it should take you to fully understand the concepts and topics taught within each lesson. In addition, we help you track the time you spend studying to ensure that you fully understand the concepts in which you will be tested. Your course includes straight-forward, easy-to-read text, interactive illustrations, instructional videos, and quick quizzes. Exam Simulators – Exam simulators help reinforce your understanding of the material taught throughout your course. 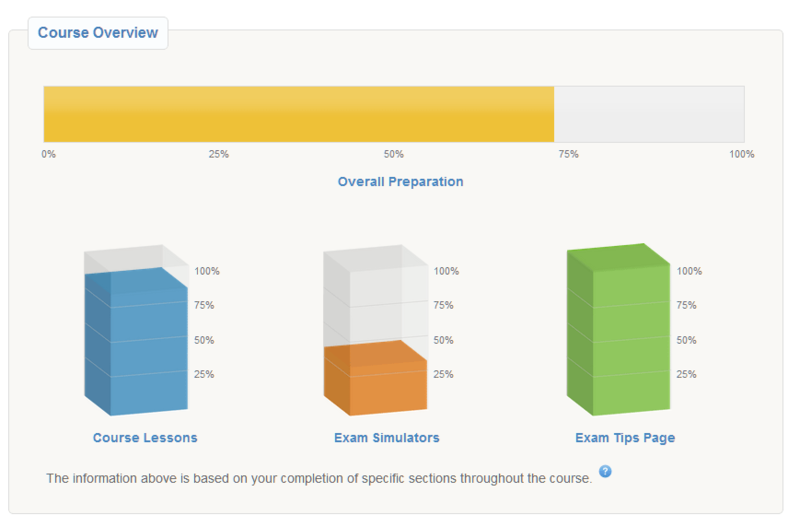 The calculation of this bar graph in your Pass Report is based on your exam simulator results. Although we provide you with sample tests in which you can become familiar with taking a computerized exam, we recommend spending most of your time reviewing the course text since it is the most important section in your preparation for the state insurance test. Your Final Score is calculated and displayed in the horizontal bar graph and represents your overall preparation for your state insurance exam. As detailed in How to Streamline Your Insurance Exam Preparation, each section of the state exam contains a different number of questions which is displayed in the exam content outline. This portion of your Pass Report provides you with transparency, showing you the amount of time you have spent in each lesson and compares it with the amount of time we suggest you spend in order to be prepared, based on the exam content outline. 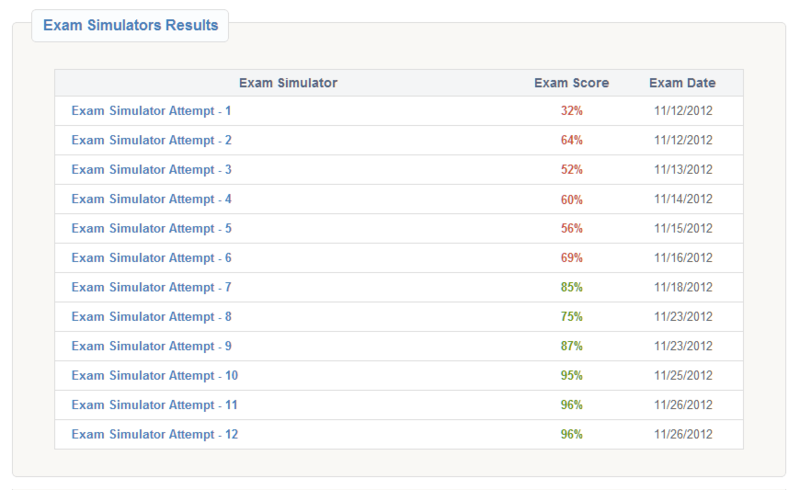 This section allows you to track your practice exam results using our Exam Simulators. Your Pass Report also tracks your course lesson exams as well as your course final exam scores. Pass Report is one of many features that is included in your course when you enroll in our online insurance school.